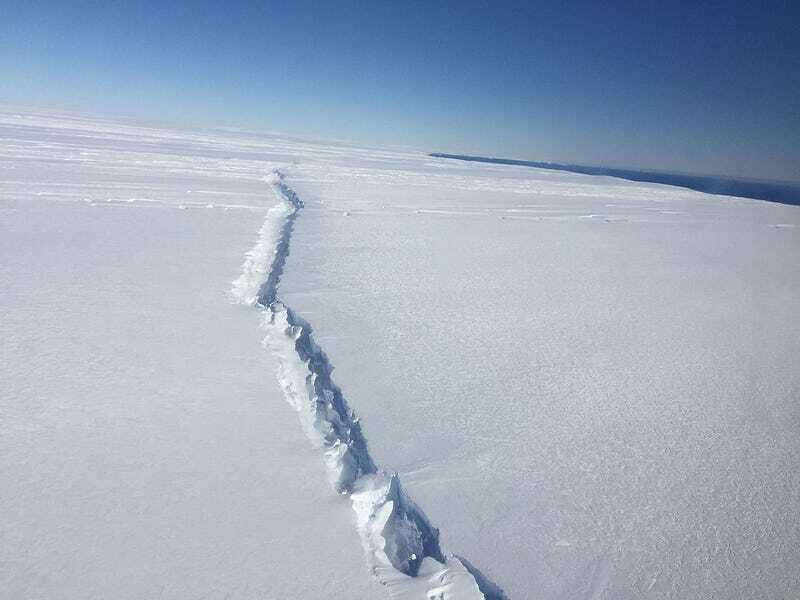 For over two years, the U.K.-based Project MIDAS has been monitoring a large, fast-moving rift in the Larsen C ice shelf, located on the northern end of the Antarctic Peninsula. On Wednesday, researchers with the European Space Agency released a detailed analysis of the soon-to-be iceberg. Data collected from ESA’s CryoSat satellite, which measures and monitors polar ice in Greenland and Antarctica, shows the iceberg will likely have an area of more than 2,500 square miles — larger than the island of Bali in Indonesia. It’s expected to be about 620 feet thick and contain about 277 cubic miles of ice, according to ESA. Below the surface, the iceberg could reach a depth of nearly 700 feet. “This is a single piece which is remarkable I guess because it’s of somewhat biblical proportions,” Mark Drinkwater, head of the mission science division at ESA’s European Space Research and Technology Centre, told Mashable. Researchers warn the iceberg will likely be so large that it could pose a risk to maritime traffic. “Whole or in pieces, ocean currents could drag it north, even as far as the Falkland Islands,” located east of South America’s southern peninsula, Anna Hogg of the University of Leeds said in a statement. “If so it could pose a hazard for ships in Drake Passage” ― a stretch of ocean between South America’s Cape Horn and Antarctica. At 21,000 square miles, Larsen C is the largest ice shelf in the region. In recent years, however, what started as a small fracture has moved rapidly through the frozen structure, widening to more than 1,000 feet. During the month of December, the rift grew by more than 10 miles, followed by another 6 miles in the first few weeks of January. Between May 25 and May 31, it grew by an astounding 11 miles — over 1.5 miles per day. Today, the fissure is over 120 miles long, and only about three miles from reaching the ocean, according to ESA’s new analysis. Along with fundamentally changing the Antarctic Peninsula, scientists worry a break-off could destabilize the entire shelf, meaning Larsen C could be headed for a similar fate as nearby Larsen A and Larsen B, which collapsed and disintegrated in 1995 and 2002, respectively. In 2014, over a decade after Larsen B’s collapse, scientists determined the event was triggered by rising air temperatures. Since ice shelves float on the ocean’s surface, the impending calving event won’t immediately raise sea levels. An event of this scale, however, could destabilize the entire shelf, resulting in its disintegration and the release of the glacier ice it holds back ― which ultimately would raise sea levels. How long that process could take is difficult to pinpoint. But scientists estimate that if all the glaciers behind Larsen C ended up in the ocean, it would raise global sea levels by about 10 centimeters, or 4 inches. This story was originally published by HuffPo and is reproduced here as part of Climate Desk.